A biological cell can be thought of as a hive, in which proteins play the role of the worker bees. However, proteins are far more versatile and can interact with each other to form molecular machines. In order to understand the mechanisms that underlie their functional versatility, structural biologists have relied primarily on the analysis of their three-dimensional structures following crystallization. However, protein crystals provide an essentially static picture. "So, this approach on its own is insufficient," says Thorben Cordes, Professor of Physical and Synthetic Biology at LMU. "We need to understand the molecular motions and the structural alterations that take place in proteins in the course of their operation." Cordes and his research group have concentrated on finding ways to visualize protein dynamics. In cooperation with teams at Imperial College London and the University of Groningen, they have now succeeded in characterizing the conformational changes that occur in a class of membrane-integrated transport proteins. The researchers focused on what are called ABC transporters, essential membrane proteins that are involved in a plethora of cellular processes including nutrient uptake, detoxification and immune reactions. All ABC transporters are made up of two modules. A transmembrane domain, which is embedded in the membrane, forms the pore through which the substrate is exported from the cell. The intracellular nucleotide-binding domain is responsible for supplying the required energy -- which it does by binding and breaking down ATP, the cell's major carrier of chemical energy. 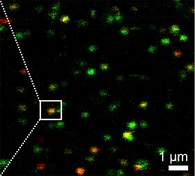 In order to determine how ABC transporters actually dispatch their substrates across the membrane, Cordes and colleagues used a recently standardized method called single-molecule FRET. The technique is based on the fact that when different fluorescent dyes are chemically attached, site specifically, to interacting molecules or domains, the fluorescence signal varies with the distance between them (owing to 'fluorescence resonance energy transfer'). These changes can be measured with a sensitive microscope, allowing one to monitor both changes in conformational structure and binding interactions between different protein subunits. "In this way, we were able to show that transport of the substrate across the membrane requires major changes in the conformation of the ABC protein," says Cordes. Both modules of the transporter can exist in either an open or a closed conformation. At the beginning of the operational cycle, the nucleotide-binding domain is open inwards. Binding of an ATP molecule then triggers the closure of this module. If -- and only if -- a substrate is already in the pore formed by transmembrane domain does the transmembrane domain adopt an open conformation, releasing the substrate into the medium, and then closing. Only then is the bound ATP hydrolyzed, and the energy released serves to restore the open configuration of the nucleotide-binding domain. The authors of the new study hope that single-molecule FRET will become the method of choice for further investigations of ABC transporters. "This class of transporters is also involved in the pathogenesis of many serious disorders including cystic fibrosis, as well as in resistance to cancer drugs," Cordes explains. "A better understanding of their transport cycles could therefore open up new therapeutic opportunities." Illustration: Single-molecule FRET analysis of the membrane-bound transport protein McjD shown in false color (green, McjD labeled with the donor fluorophore only; red, McjD with the acceptor fluorophore only; orange, double-labeled McjD). Image: Cordes.